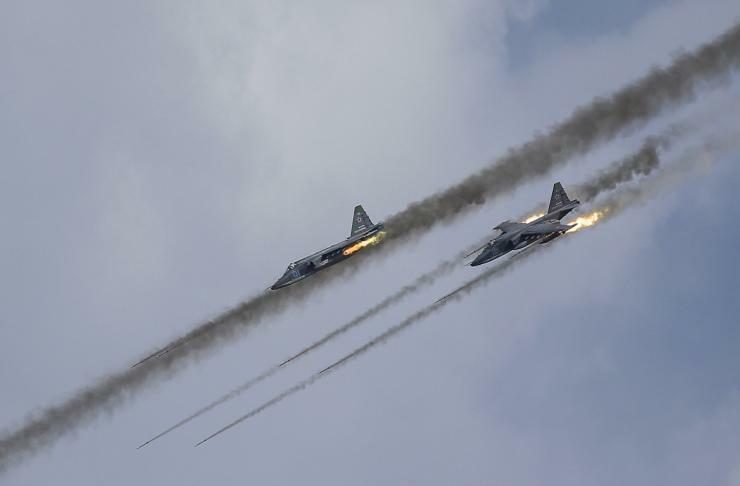 You can run, but you can’t hide when Russian pilots are flying close air support. “The key to the East is in the hands of Damascus,” “The curtain calls for ISIS” - and similar headlines can be found among a great variety of Arab media sources, reporting on the liberation of the besieged city of Deir ez-Zor. For more than 1,400 days terrorists would try to assault the surrounded city in a bid to seize massive small weapons and munitions arsenals. However, the latest successful push by the Syrian government towards the city, with Russian aircraft providing support, has allowed Damascus to score a number of points strategically, politically and in terms of moral vindication. This push resulted in this region, inhabited by a million of mostly Sunni people and the richest of Syria’s hydrocarbon fields, returning to Damascus’ control. This will eliminate the fuel deficit that the country has been suffering from over the past three years. After securing the Deir ez-Zor region the Syrian army will continue making its way toward Iraq to recapture the Abu Kamal border crossing. This will allow Damascus to exercise full control over the 250 miles long border that it shares with Iraq, preventing terrorists from supplying and reinforcing remaining strongholds within Syria. This latest success is the completion of a series of successful offensives carried out by the Syrian Arab army that began in Aleppo, then Hama, and proceeded to the outskirts of Damascus. As a result, according to the Al-Manar newspaper, ISIS has lost the absolute majority of its territorial gains, being pushed back to as little as 15% of Syrian territory. Thus, the Syrian Arab army has completely seized the initiative on the battlefield, resulting in major changes across the Middle Eastern geopolitical space. The Tunisian Ash-Shourouk newspaper has noted a total meltdown observed among the main political and financial sponsors of armed anti-government forces, resulting in them abandoning the “Assad must go” mantra. The United States, France, Saudi Arabia, Qatar, and Germany have all changed their priorities, focusing this time on the actual fight against a common enemy – international terrorist groups. Turkey was the first to alter its tactics, since its immediate neighbor has managed to survive the onslaught inflicted upon it. Damascus will continue affecting matters across Turkey’s border with Syria for many years to come. At the same time Erdogan’s position on the actions of his sworn enemies – the Kurds, as they continue pursuing their eternal dream of a sovereign state all while enjoying Washington’s full support, has pushed Ankara back into an alliance with the Syrian government. The Turkish military leadership has expressed its readiness to join the Tehran-Damascus-Moscow axis. Turks, experts believe, are determined to withdraw their forces from Syria, as soon as Damascus’ ability to ensure that no militants, including the Kurds, will fill the vacuum. According to a number of Arab analysts, under the influence of changing political currents the position of the Gulf countries is shifting as well. In general, all the Gulf countries are affected by the decline in oil prices and an abrupt drop in oil revenues that constituted their main source of income. This forces them to cut costs, including their foreign military and political adventures. The recent discord between Qatar and Saudi Arabia, the UAE, Bahrain and Egypt, also distracts their attention away from their objectives in Syria. Media attacks on Syria that started with the beginning of the so-called civil war back 2011 were pushed forward by various regional media sources. They continued until very recently, insisting that the “Syrian regime is on the brink of collapse” and that its days “are numbered”.